On the whole, Bossier City can be viewed as the perfect place to live with a mix of creatives, growing families, community supporters, the military community and those with business-minded goals. The city has the perfect blend of a thriving community. In fact, this city is like a smoothie in itself. Because of this blend in Bossier, those business-minded individuals have now started a smoothie revolution here for the locals to enjoy. On the north side of Bossier, there is one smoothie place taking nourishment to another level. Fruits of the Spirit focuses heavily on its mission to provide quality ingredients and to glorify God in everything they provide. Located conveniently right next to ChristFit Gym, this location has some of the best ingredients in addition to motivation from scripture. On each cup there is a verse written from the Bible to provide motivation. “[Putting verses on the smoothie cups] is just a pick me up for the spirit. It’s a daily reminder for us,” Manager Lacey Green said. Each of the menu options follow the qualities that make up a perfect vision of health. Plus, every month they offer a different self control smoothie option. 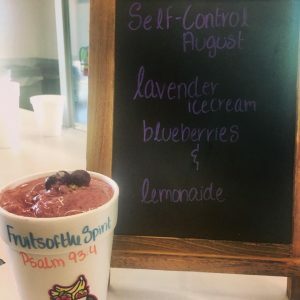 August’s smoothie is lavender ice cream, blueberries and lemonade. 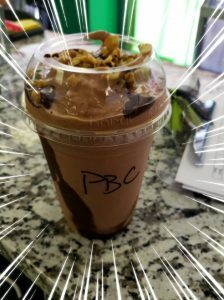 Owner Julie Weatherall highly recommends the August creation as well as the Peace smoothie. Also, check out Fruits of the Spirit’s happy hour each day from 7-10 a.m. and then 2-4 p.m. Any size smoothie is $5. Right near Barksdale Air Base, Good Nutrition is taking its customers to the next level. 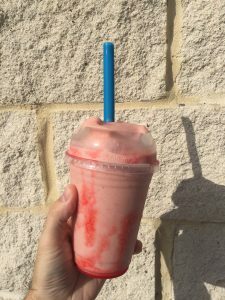 The smoothie location is a hidden gem but is quickly picking up a large following on social media. Good Nutrition is owned by Coti Dawson, Shantia Stringfellow and Zarita Williams. These three owners believe in their smoothies and are transforming the community into a fit one by pairing a balanced meal replacement option with fitness camps. With exercise and a delicious shake, each of them have witnessed the weight loss transformation in many lives. Good Nutrition offers a 30 minute free Fit Camp at 6:30 p.m. each Monday through Wednesday. This camp is a workout that aids customers in achieving their fitness goals. They also offer a Dance fit class on Fridays. Be sure to follow Good Nutrition on Facebook to learn more and keep up with their camps and classes. From the outside, it looks like a diner – in fact on the inside it looks like a diner too – but at Healthy Me Nutrition Club’s location on Old Minden Road, it’s actually all about the smoothies, shakes and tea. Owner Laura Hayes created Healthy Me five years ago. With her experience as a registered nurse and a Herbalife Coach, it was an easy transition for her into this business. Each basic shake has 24 grams of protein, 13 carbohydrates and between 200-250 calories. They use Herbalife products. Hayes said her shakes can be meal replacements if you are looking for a quick healthy alternative. “We serve over 100-115 clients a day at our location. I am absolutely love being able to give back to this community, being able to see the results and the smiling faces of people who come into our positive environment,” Hayes said. The club offers a weight loss plan of replacing 2 meals with their shakes in addition to a healthy meal and 2 protein snacks. They can personalize a plan for anyone and also offer one-on-one coaching. They also have Herbalife Nutrition Club locations in Haughton, Shreveport & Minden.